*Any and all activities, lodging, and meals outside of Casa L’Amore are not included. All adventure packages have minimum of two per party. Off to Otavalo home of the best outdoor market in Ecuador, spend the night at Hotel el Indio, dinner at your choice of restaurant, accompanied by your bilingual guide. Then breakfast at the Hotel off to Cotacachi, amazing leather works, then drive up to the Colombian border, & back to Pululahua Crater/Casa L’Amore where you’ll spend the night. Relax, enjoy a massage, tour of Pululahua and Yunguilla ride in an unforgettable mule drawn carriage and enjoy 3 wonderful meals while your wardrobe is refreshed. Up 7:am breakfast at the Crater join your bilingual guide and driver for a full day of adventure starting in Nanegal, try some sugarcane Agua Ardiente (moon shine) or the very best natural fruit shakes then, On to Mindo. Butterfly capitol of the world, tour the giant butterfly dome, go white water rafting, and zip line across the most beautiful rainforest in the world. Spend the night in Mindo. Up early breakfast, than off to Santo Domingo de Los Colorados ( gate way to the jungles) See the Colorado Indians in their village, they’ve never conformed to civilization, several amazing trips available including canoe excursion up the head waters of the Amazon River. Head back to the Crater and Casa L’Amore at the end of the day. Early breakfast, and snacks then off to the airport for flight to Cuenca.Arrive Cuenca settle into hotel then off to city tour. Cuenca is considered one of the most preserved Colonial cities in South America, declared by UNESCO a world heritage site. Also available El Caja National Park, spend the night and amazing dinner at one of the best reviewed eateries in Ecuador. Up early, breakfast at hotel, then off to Loja the Capitol of the state of Loja the jewel of the Andes, then to Vilcabamba where many expatiates reside, having found the best place to live on earth. If you don’t believe them, just ask them, LOL. Back to Cuenca for some great night life and another night in this magical city. 400 US dlls a day per person, plus meals and lodging (before and after the train) we will provide transportation bilingual guide and driver in coastal portion. Up at early about 9:am enjoy a good home cooked breakfast then a trip to explorer the Pululahua Volcano Crater, and up to Yunguilla by mule drawn cart. Next day to the train station in Quito for the Train ride of a life time. The railway was built to connect Ecuador's two major cities: Quito in the Andes and Guayaquil along the Pacific. Now as then, it's one of the most thrilling railway journeys in the world. Tickets cost $1,200 for adults ($952 for children) and include all hotels and excursions in route. The train's newly purchased carriages, built in Madrid, and are pulled by restored steam locomotives. The oldest dates to 1900 and was engineered by American manufacturer Baldwin of Pennsylvania. From Guayaquil we’ll get off the train for a couple days and visit the coast including Bajia de Caraquez, Montanita the sea side party town,we’ll spend the night here. Then on to Crucita and many more amazing coastal villages and back to Guayaquil for train ride back home. The track home is different than the one down. 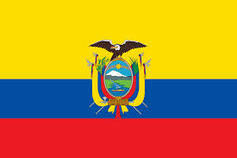 The journey to Quito passes 10 volcanoes along the so-called Avenue of Volcanoes. Arrive back in Quito get picked up at train station then drive down to Pululahua Crater, Casa L’Amore for some well-deserved R&R and great food. Next day to airport and flight home.